In one of my previous blog post, we learnt how to implement the speech recognition in Windows Phone 8 using the Built-in grammars and the List Grammars. 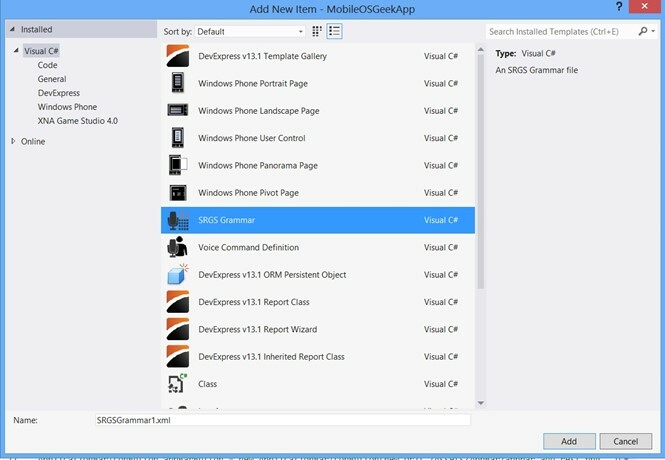 This blog post will explain in simple steps on how to integrate the speech to text feature in Windows Phone 8 using the SRGS Grammars. SRGS stands for Speech Recognition Grammar Specification where the phrases for the speech includes rules and semantics. The SRGS file is a simple XML file with predefined tags that conforms to the SRGS v1.0 specification. 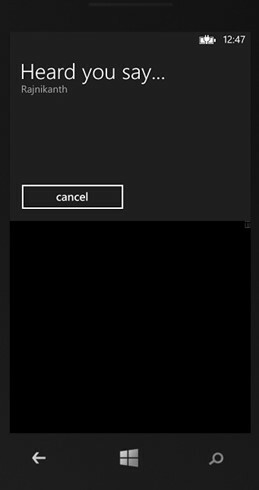 In the Windows Phone Project, right click on the project and select “Add” -> “New Item”. This will display the “Add New Item” Dialog. Select the “SRGS Grammar” template, provide a proper name for the file “SRGSGrammar1” and click “OK”. This will add the XML file to the project as per the SRGS specification with the sample data. <grammar version="1.0" xml:lang="en-US" root="Actors" tag-format="semantics/1.0"
The “rule” element defines the text that the user can say. The grammar should have alteast one rule. It can contain the elements “item” or “ruleref” elements. That’s it. We are ready to run the app and test our simple SRGS grammar. When the SpeechRecognizerUI dialog is shown, speak one of the items defines in the rule “Actors” of the SRGS grammar that we created above and you should see the sample result as shown below.